SANFORD - "A once in a lifetime experience." That's how Central Carolina Community College history instructor Bianka Rhodes Stumpf described a special lesson that her World Civilizations students received on the art of Chinese calligraphy. 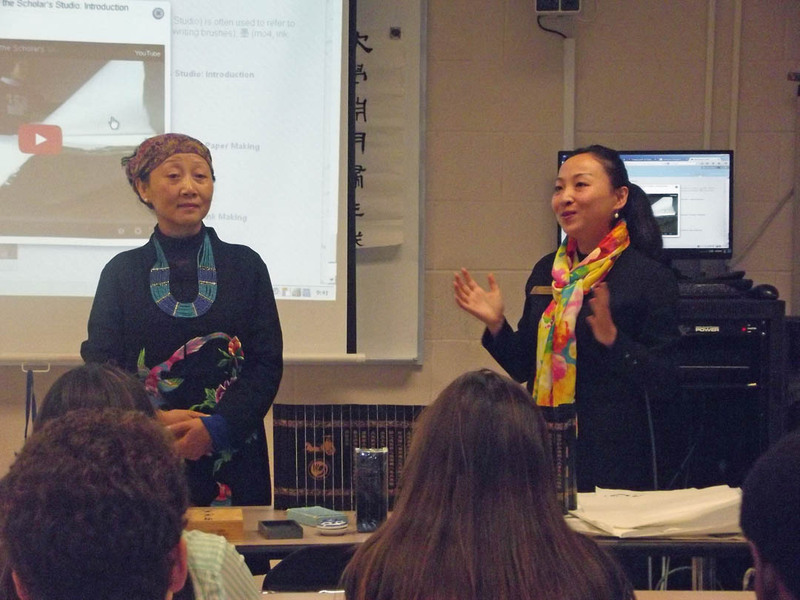 Guan Wang, the college's Confucius Classroom instructor, and her mother, Feiyan Liu, from the People's Republic of China, visited with the students and shared their knowledge in this international cultural experience. Wang's Chinese language students also were present for the presentation. Liu is vice president of the Sichuan Yangtze Art Academy. Her expertise lies in traditional meticulous paintings of people, flowers and birds. Collectors from Southeast Asia and Europe have purchased her paintings. Stumpf said she wanted students in her class to see China from a historical and cultural perspective - and that the Confucius Classroom helps to provide that opportunity. Liu, through the interpretation of her daughter, shared the history, tools, and craft of writing Chinese characters and calligraphy. She also showed students some of her realistic artwork painting on silk. Liu said that calligraphy is closely related to painting - and that it is a reflection of one's personality. After that, students were given a brush, rice paper and calligraphy ink to experience calligraphy themselves, with Liu and Wang giving instruction. Students were taught to write 1,2,3, wisdom, honor, love and friendship. The enthusiasm of the students was evident. "I like it because it's a new experience," said student Haley Atkins, of Sanford. "I think it's exciting as I've never been able to do anything like this," said student Olivia Yarborough, also of Sanford. The two students indicated the experience was more real, thanks to the Liu's visit. Student Jonathan Wimberly, of Sanford, also was impressed with Liu's visit. "I think it's pretty cool," he said. "It's a good experience that she's here to teach us." Stumpf believes the visit was beneficial for her students. "I think the students got a chance to see a more rounded view of China - one that showcases the history and the culture - and even shows that wisdom, honor, love, and friendship are part of an international language of shared values," she said. "I could see from the students' enthusiasm that it was a memorable educational experience for them." CCCC's Confucius Classroom was founded in 2009 in partnership with N.C. State University's Confucius Institute and Nanjing Normal University. It was the first community college in the nation to have a Confucius Classroom. The CCCC Confucius Classroom promotes an intercultural exchange of language and culture through a range of educational and outreach activities, including hosting cultural events and offering both curriculum and continuing education Chinese language courses. To schedule a CCCC Confucius Classroom presentation, contact Confucius@cccc.edu. For more information about the Classroom, visit www.cccc.edu/confucius. For more information about the CCCC Social Science Department, call 919-718-7346.